In 1880 „Alfons von Bayern“ joined the army and in 1892 became commander of the Bavarian „Schweren-Reiter-Regiment“. 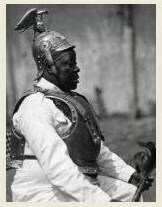 In 1905 he reached the rank General of Cavalry, finishing his career as the commander of 7 K.B. Chevaulegers-Regiment. You should ask "adler", he own's quiet a lot of Prince Alfons of Bavaria. Further I found some pictures on „www.hermann-historica.de“. They show Alfons of Bavaria in the Uniform of his Dragoner-Regiment No.5 and with a Lionhead-Sabre, I guess. Maybe with the Sabre I bought (unfortunately I can’t add Pictures to this Forum, allways get a Server-Errormessage). Great sword and display. Thanks for sharing.